Polyversal is a new 6mm-15mm sci-fi mass combat miniatures system designed by Ken Whitehurst and published by Collins Epic Wargames. The Polyversal system works with miniatures you may already have in the 6mm-15mm range and will include Combatant Design Rules, allowing you to quickly and easily customize your armies within the rules of the system. The setting is a gritty plausible future with a storyline that promises to capture your imagination while providing endless hours of gaming entertainment. Don't have 6mm miniatures? No problem. We're working with 5 miniatures manufacturers to supply a selection of miniatures for a boxed version of Polyversal with three initial expansions. The base boxed set includes everything you need to play the game- gorgeous combatant unit tiles with incredible artwork, dice, tracking counters, a comprehensive rulebook and miniatures from some of the best manufacturers out there. Expansions include more models and more tiles for use in the game. Check out the Products tab for more information. Hulking armored vehicles patrol abandoned city streets amid wrecked buildings and the constant threat of ambush from stray infantry lurking among the rubble. In the distance, sleek grav-tanks hurtle toward the city's perimeter, peppered by harrassing fire from attack VTOLs and the lumbering walkers awaiting their approach from the relative safety of the city's edge. Missiles streak overhead. The clatter of gunfire echoes between the buildings. Your men await your command. As your units take fire, the net fills with the din of battle. 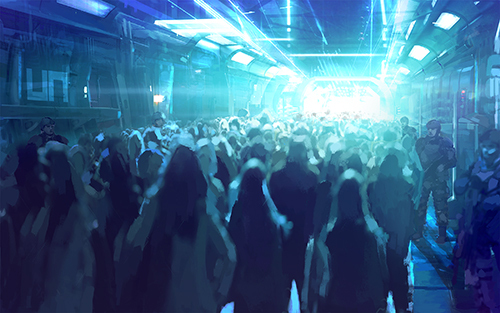 Your commanders seek updated intel. Their reports take urgency as enemy fire finds its way home. Stress mounts. Morale degrades. Mistakes are made. Wills are tested. You call the shots from the relative safety of your command center. But will your troops perform as expected? Can their equipment, or your plan, survive contact with the enemy? As battle is joined, the answers come quickly, and painfully. 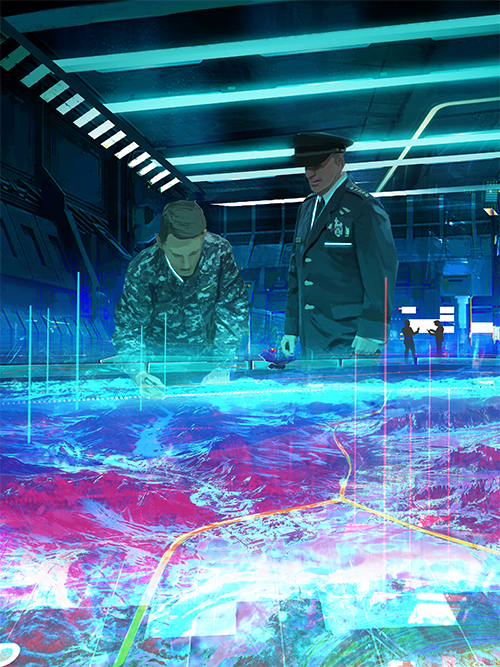 Polyversal puts you in command of a plausible-future science fiction army. Intended for 1/300 scale (6mm) miniatures but compatible up to 15mm, battles in Polyversal are fought not between a few squads of men, but entire companies of vehicles and troops. You are not in command of a raid on a small compound. You must hold the entire city. Select the right balance of forces for the mission. Plan your orders carefully. Execute your plan. Polyversal uses polyhedral dice (D4-D12) to reflect the combat qualities of your units. A single roll of three dice is used to resolve fire combat, without the need for multiple re-rolls to determine hits, saves, and damage effects. And because all of the information you need is on each unit's color-coded stat card, your eyes will remain on the battlespace, not in the rulebook. New to science fiction mass combat? Polyversal includes everything you need to get started- including miniatures from multiple manufacturers with Combatant Tiles we design in boxed versions of the game. Are you a verteran gamer with armies amassed over years of campaigning? Polyversal's easy to use Combatant Design System will allow you to develop your own customized tiles for every model in your collection, regardless of its manufacturer. 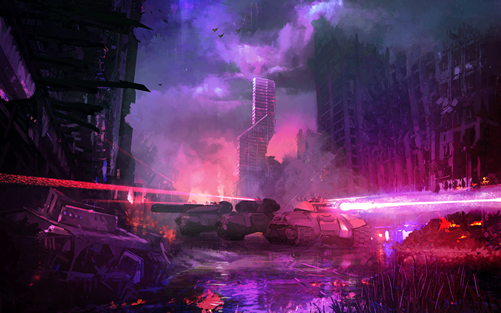 While gameplay is all about the battle, Polyversal also tells a compelling story of future Earth-based conflict between an oppressive and powerful future United Nations and those who oppose the UN known as the OPFOR or Opposition Forces. In addition, Mercenaries rise up to power and may work for either side- whoever bids the highest for their services. Why are these forces engaged in battle? Who are they and where are they from? Polyversal has a great story to tell... And you are invited to help expand what we present and tailor it to suit your own needs for campaigns. Watch the Story Teaser video below and read more about it here on the Collins Epic Wargames blog. Polyversal does not lock you into our story. Consider it "Open Source" regarding the setting. You can play the game system in any setting you create or choose. Be creative, and please let us know where your story takes your games! Check out the Products tab on this site to read about each of our Base Sets, Expansions, and Accessories. Read a detailed post about the Concept of Polyversal on the Collins Epic Wargames blog. This post goes into how Polyversal was first disovered, the concept of what we're doing with the game in detail, and what's in it for us, manufacturers we partner with, and most importantly, YOU! As always, we invite you to ask any questions you'd like either by e-mail, Facebook, or in the dedicated Polyversal forums on Boardgamegeek or Tactical Command. Contact us here.